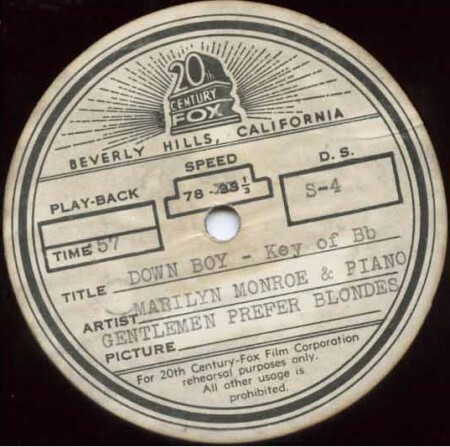 “The 43-year-old record producer is sampling the late Gentlemen Prefer Blondes actress’ only unreleased track, a swing number titled ‘Down Boy’ 53 years after she died of an overdose. Jack Allen‘s name will be familiar to fans, as he authored the 2002 book, Marilyn by Moonlight: A Remembrance in Rare Photos. Long out of print, it is now highly collectable. Fans may also remember a similar news story from Entertainment Weekly in 2006, when Allen tried to shop ‘Down Boy’ to various female pop stars. It was briefly rumoured that Britney Spears would sample the track, but nothing came of it – so I would advise readers to treat this latest update with caution. This unreleased song came from an 20th Century Fox playback acetate record, made for the music numbers in the movie. An acetate is a transitional stage between the master tape and the finished vinyl record. It is a metal plate covered in a layer of acetone. Very few are made and they are distributed to people directly involved with the recording in order that they can approve the sound before the record is cut. 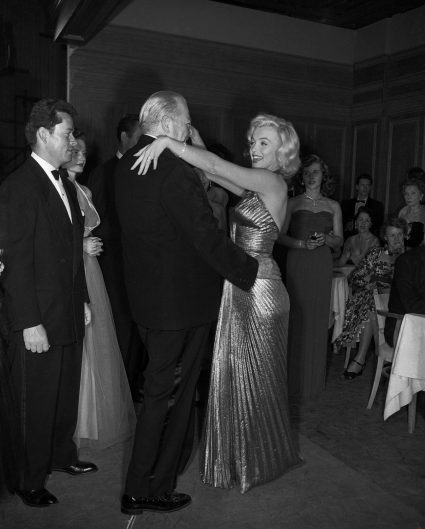 ‘Down Boy’ was intended for a scene in which Lorelei (Marilyn) dances with elderly millionaire (Charles Coburn.) Some footage can be briefly glimpsed in the film, although plans to include ‘Down Boy’ were abandoned. You can listen to a snippet from the original recording here. The song, penned by Hoagy Carmichael and Harold Adamson, was later performed by Betty Grable in a 1955 musical, Three for the Show. You can watch it here.